Dr. Cheryl Krause-Parello is the founder and Director of Canines Providing Assistance to Wounded Warriors (http://www.ucdenver.edu/academics/colleges/nursing/research/c-paww/Pages/C-PAWW.aspx), a military health research initiative focused on improving health outcomes for veterans, particularly those living with invisible wounds of war. She serves on the Military Expert Panel for the American Academy of Nursing, as an Ambassador for the Patient-Centered Outcomes Research Institute, and as the President of the International Society for Anthrozoology. Dr. Krause-Parello’s research demonstrates biological stress reduction in active-duty military and veteran populations when interacting with a therapy dog. 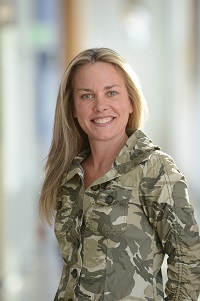 In concert with her qualitative research on the beneficial impact of service animals for veterans with PTSD, Dr. Krause-Parello’s work provides an empirical basis for public policy change to reclassify service dogs as a reimbursable medical expense. She was one of the first scientists to demonstrate that animal-assisted interventions reduce biological stress markers in people facing stressful situations, like forensic sexual assault interviews and medical transport. © Copyright 2016 American Academy of Nursing. All rights reserved.